A New York Times best-selling author. A Paralympic athlete. A national debate champion in India. A 2016 Genius Olympiad. The founder of a nonprofit that teaches Latin to inner-city students. 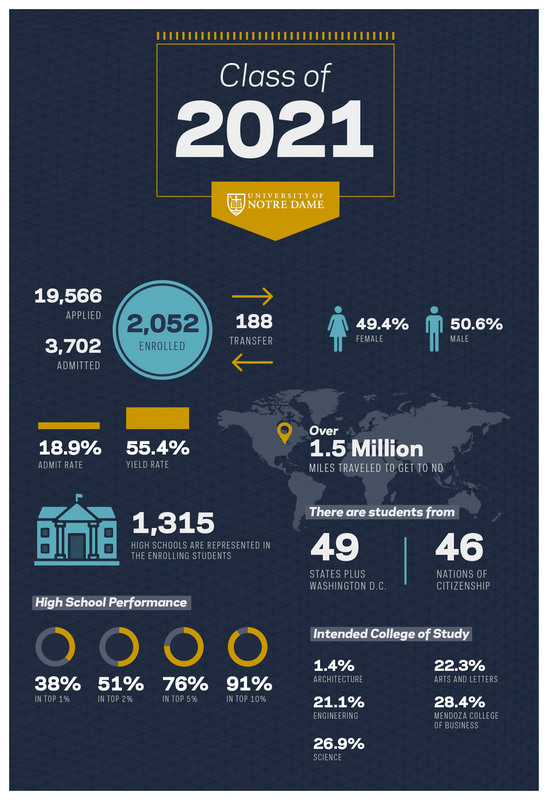 These are just a few of the 2,052 students who comprise the University of Notre Dame’s Class of 2021, an intellectually and globally diverse group and the first to feature more than 1,000 women, including a substantial number of aspiring engineers. Members of the class, marked by high academic achievement and a commitment to service and leadership, arrived on campus this week for the start of the fall semester. “This year’s entering class has a tremendous demonstrated record of academic talent, but what really excites me about this class is the potential for these students to turn their intellectual curiosity and non-academic passions into a real force for good around the globe,” said Don Bishop, associate vice president for undergraduate enrollment. Of the 30 percent of students with a reported class rank, 4 in 10 finished in the top 1 percent of their class; 8 in 10 finished in the top 5 percent; and 9 in 10 finished in the top 10 percent. Overall, 86 percent of incoming students were involved in service leadership; 41 percent were leaders in worship activities; and 47 percent were active in the performing arts, including theater and music. Among the record number of incoming female students, 38 percent plan to study engineering, compared with 32 percent last year and just 20 percent nationwide. The number of women enrolling in the Mendoza College of Business has risen as well, from 31 percent last year to more than 34 percent this year. The majority of incoming students — 41 percent — attended public schools. Thirty-eight percent attended Catholic schools; 12 percent attended private or charters schools; 8 percent attended international schools; and 0.6 percent were home-schooled.More than 19,500 students applied to the University for the 2017-18 school year. 3,700 were accepted and 2,052 enrolled. The yield rate — the percentage of students who enrolled after being admitted — was 55.4 percent, placing the University among the top 10 in the nation for private national research universities. By region, 23.4 percent of the incoming students from the U.S. hail from the East Coast; 14.3 percent from the South; 15.6 percent from the Midwest; 19.2 percent from the central Plains; 18.4 percent from the West/Southwest; and 9% come from outside of the U.S. states. More globally, the class represents 49 states, 46 nations and the District of Columbia. They have traveled a combined 1.5 million miles to get to campus — equal to three trips to the moon and back. On the financial aid side, 54 percent of the students received Notre Dame scholarships, fifth highest among the top 20 private national research universities. Scholarships for students with demonstrated need averaged $36,000, and 4 in 10 students receiving need-based scholarships had their need met without loans. Those who did need loans borrowed to cover 6.3 percent of their total student budget on average, down from 10.3 percent over the past decade. By race, the class is 67.8 percent white; 10.9 percent Hispanic; 7.6 percent Asian; 6.3 percent African-American; 6.3 percent international and 1 percent Native American. African-American enrollment has reached record levels over the past five years, and Hispanic and international enrollment continues to rise. Overall, diversity is up by 100 U.S. students of color and/or international students since 2010. Among applicants with a 33 to 36 ACT score or a 1510 to 1600 SAT score, just 49.8 percent were admitted this year, down from more than 80 percent seven years ago, reflecting a more holistic approach to admissions that relies less on test scores. Originally published by Erin Blasko at news.nd.edu on August 21, 2017.